Only recently I realized where I had seen Beri before. I found a video of last year’s Kumzits on The Hudson where Beri sings very lebedik, and I remember thinking “I hope this guy comes out with an album”. He has such Chayus and Freilachkeit in the way he sings his songs. It is very soul warming, I’m glad to see a beautiful product. It was worth the wait. Lately we have seen several new Chassidishe singers, starting with the trend setter Lipa. Many have followed, just to name a few: Shloime Gertner, Shlomie Daskal, Yisroel Werdyger, Yossi Mayer, Shloime Taussig. They have added a lot to the Jewish music market and have all put out amazing CDs with great quality music and songs. Looks like there are some more stars rising. There is place for you all, hop on in! We are all thirsty for good quality Simcha. Let’s start going through the songs, I am not a fan of rating a song in *stars*, so I will just go through track by track writing my thoughts about that song, I will leave the rating to each and every one of you, readers. Hold on tight, you’re in for a good ride. Chayim – Just to keep the beat up a bit here you have another fast song. This song has a very nice musical arrangement, by no other than MONA himself. One musical feature that has to be put in the spotlight is the piano played by Yaron Gutfried, it is skillfully integrated into the song, and it can be heard at 1:45 very nicely. This song has the Chayus to it, to live up to it’s lyrics “Gedolo Torah Shenosenes Chaim” (Great is the Torah that gives Life). Avinoo – Here we slide into the slow lane. I like the way this song goes from the low part to the high part – it’s beautifully done. Beri’s vocals also sound very good in both parts. The song is a bit on the longer side, just over 6 minutes. I know the song is composed by Lipa, and yes it is a good song, but it will just not qualify as the best song. Rekidale – The tunes and the lyrics are a very good match again, a very Freilach song composed by Motty Ilowitz. Motty is having an immense impact on Jewish music, with great lyrics and songs that he has composed and written for various singers. I have also heard him sing himself very nicely (I wonder if he is coming out with an album himself). Nice Saxophone solo @3:45 followed by some Shtick that ends the song very nicely. Shabbos Hi – A very Hartzige Song Composed by Aron Y. Spilman with beautiful lyrics by Motty Ilowitz. The Piano starting of this touching melodious tune then blending with the violin begins this childs story. The child soloist in the beginning of this song gives a great emotional touch, as if you are hearing the story from the one it is happening to. The Child asks “Ven Hob ich shoin a Refia” (When will I have a recovery) and the child is answered “Vein Nish tei’er Kind, Di Vest IY”H Zein Gezint” (don’t cry dear child, you will IYH be well). From there the song goes on to ask from the almighty “Tate” that Klal Yisroel is waiting for the ultimate Yeshua. The choir ads a very nice and soft touch to the song. “Gut shabbos Alle Yidishe Kinder Un A refia Sheleima” with the Yom Shekulo Shabbos – Omein. 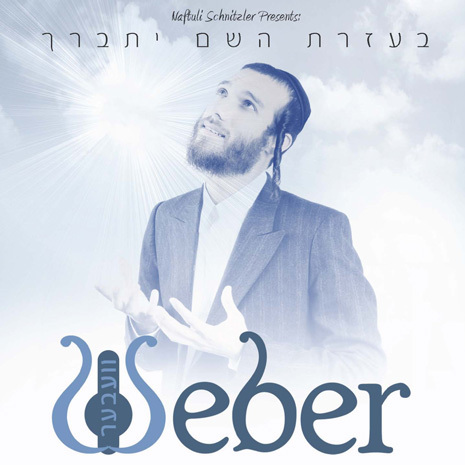 Der Weiber – (that is how I would spell it not “Der Vaiber”) Der Weiber is hands down my favorite song on this album, it has the modern beat that you can find yourself singing along to. This Song has Lipa all over it and I’m loving it. I heard Lipa on the JM in the AM when Beri was being interviewed by Nachum Segal, Lipa said that he could have used this song for his own album as “Ver is de Schmelter” (who is the welder) which is also mentioned in the same Tefila of Yom Kippur. Who knows maybe one day we will hear the Lipa Version of the song. The arrangement by Shai Bachar is amazing to say the least. The picture in the booklet of Beri, weaving with great concentration is hilarious. Here I will also mention the quality of the booklet that comes along, when you buy the CD (or download). Every track has an other picture of Beri doing something related to each song. We have seen several artists now that have name related songs, and I think that is a very cute touch. We have heard it in Legabay by Dovid Gabay, R’ Mayer Omer by Yossi Mayer and Pruzbul by Michoel Pruzansky. It’s nice to see how they reference their name to a Torah source. Vhaarev Nu The song starts off with a childrens choir. To me the message is, we have to teach our children the Torah in order to keep the Torah’s flame alive. A very nice flowing song, not a slow song, but then again I would not call this a very fast song either. Maybe this song was placed after “Der Weiber” to just calm you down a bit after such a great song. At the songs end we get right into the learning “Tuni Rabunon, Huben Rabunon Gelerent”. Just an observation: The picture in the booklet could have used different glasses (from the Weber photo shoot), you could have borrowed Lipa’s! Yehi Rutzoin Here is a piece of the Selichos Davening, where we ask Hashem to hear our crying voice and save us from all evil. The start of the song has a bit of a Shofar sounds to it, but from what I can make it out to be, it is a trumpet. This tune is for sure to give you the Slichos feeling. Chazak In this song you can hear how soft Beri’s voice is. The choir does their job very well, but the song itself is not one of the better ones of this album, you will always have songs that are not bad at all, but they are not what make this album special. A filler if I may say, but a good one. Beiloikim This song got its earlier release in the music video that was brought out. I’m not the biggest fan of the music video itself, but the tune is a good one. The music is full of energy, boosted up with some electric “auto tuning” that gives the song a very modern and up to date feeling. @ 3:20 we take the song up one notch, after that the sax shows us again what it has in store, with just another great solo. Ten Be At 2:45 Beri tells the story of the “Heilige Maharam Shif” how he begged Hashem for the strength to be able to learn Torah, and he grew to be the Holy Maharm Shif. So too, when we are in a difficult situation, we should call out to our “Tatte” to give us Koach. I like the way the story is integrated into the song, the music keeps playing and you can hear the choir in the background, and what I like most is how Beri ends off the story with the “TATTE” that gets you right back into the song. I’m usually not the biggest fan of story-time during songs, but it is so “Beri” well done that that I was drawn right in. Mi Mi Mi A very catchy tune, that could easily get stuck in your head. Its nice to see the choir joined by some children, not your usual choir. At 2:44 you will hear other “auto-tuning” well done. Overview: If you do not have this album yet, get up and run to the store to get a copy of this Album, or better, don’t get up, Just get the download version from MostlyMusic.com and save yourself a couple of dollars. I agree with the author about running to buy this cd, but this review did not convince me. I happen to have heard the cd and loved it! The review itself seems to be missing a little bit. The author did not really describe/analyze the songs…I’m sorry for writing this, but I just don’t think that the review did the cd justice. I am personally a pretty critical fan, and I thought that EVERY song was great! I don’t really know what it is…I just think that this review is missing something…Hatzlacha! Thanks Weldun for your comment, good to see that you love the CD! I’m sorry to hear that the review did not cut the cake for you. Just like music touches every individual differently, a review can also have different impact on every person. Just to pull something straight, I love this album. Every song is good indeed, I agree with you on that. But because the standard for quality of this album is so high, some songs where labeled great, and others just good. I think you guys are being a little harsh. The album is a good album, and Shmuli’s review was just fine. If you thought he missed some points (or you saw more in a song then he did) then feel free to add it, but there is no need to attack the reviewer. meiven, Thanks for your comment, and compliments! The great thing about music is that we can all have a different taste and all have different favorite songs on one album. One Hates digital music, and others loves it! I happened to be one that does not dislike digital music at all, and in Der Weiber the integration between electronic and more traditional style was done quite well IMO. We can go into a whole debate if electronic music is “Goyish” maybe we will leave that for an article one day! B’ezras Hashem – I happen to not be crazy about freilachs in general, so this is not my favorite song on the album, but it is a catchy tune that might even hit the wedding scene. The music sets the tone for the entire album because it is real. The arrangments which are fresh, include adult and children’s choir, which seem to point to the fact that the producers went all out on this album. Gedoila Torah – I do not think that this song will be a wedding hit because it is a little to slow of a rock, but for some reason whenever it is playing in my car, I find myself singing along. The song simply does not go where you’d expect it, but it goes to even better places. The kneich that he does at 3:35 is original and completely unexpected! I love it! The choirs on this song are incredible! Pay close attention! Shabbos Hi – WOW!!! Gorgeous! This song is sooo hartzig and beautiful that I can listen to it over and over again. It’s almost like a shabbos Zemer! Once again the choirs are masterful and the arrangement is very appropriate. Not too much; rather, just enough. I will also point out that this song, as well as many on the album are indicative of Beri’s impressive vocal range. I like the fact that he is not stretching to reach ‘autotune’ notes. Der Vaiber – I will specifically disagree with you on this one, ShmuliPhoto, because I found it interesting that Beri really sang this entire album with a strong Chasiddishe accent. Many of the Chassidishe singers sing some songs with litvishe acents in order to cater to the non-chasiddishe crowd. I thought that it was very impressive that Beri stuck to his roots and demonstrated that talent sells all over. (btw, I was not paid to say that…lol). With regard to the techno vs. real music debate, I will point out that obviously this is a personal taste issue, but as it happens, I don’t think that this song/arrangement would have come out nearly as complete with real music. Ironic, but true. Once again the choirs on this track, specifically those ending the track, are stunning!!! They really punch the song up a notch! Go Shira Choir! The song itself is about a beautiful concept and I was impressed with the delivery. I did not find this song in the least bit inappropriate, as I’m sure some will say. Yehi Rutzoin – A poignant and beautiful song that takes a little break from the previous speed of the album. What seperates this song from all filler slow songs is the arrangements. At 3:31 there is a really nice vocal on an octave higher that the previous lows followed by some very nice choir…this is followed by a very nice modulation. The music is calm and tasteful throughout the song. Heinai – Very original lyrics. My first thought was Kiddush Levana which is usually said on Motzai Shabbos…This is a catchy singable song; esp. the high part. The choirs are particularly creative on this track. This song also shows off Beri’s great vocal range. Chazak – Honestly, I’m not so crazy about this song. I agree with ShmuliPhoto on this one. This is really a filler song, although a nice one. Bailoikim – Great song! A really great song! It’s not too fast and not too slow. It is catchy and fun. The words are nice! Again you have the techno vs real music debate, but that is simply a matter of taste. I love this song! I love driving to it and I love listening to it. Enough said. Ten Be Koiach – Stunning song! I happen to like the story a lot. First of all, it allows the arrangers a lot of leeway to create great music and choirs underneath the narrative. This song definately brings out the sweetness that Beri has. It is such a sweet song with such a sweet message! There is some really nice sax on this track! I should point out that the sax on this album is above average! There are several gorgeous sax pieces. Keep your ears open. Mi Mi – I guess the lyrics can be considered catchy, but for the first two sections this song isn’t more than just a nice song to me. The high part is great and powerful. The music is excellent and the modulation at the end was well executed! Jerusalem our home – A very beautiful and hartzig song. It reminds me of Lipa’s A Poshiter Yid…IT’s mellow and not in a rush. The music follows that trend. May we all meet in Yerushalayim shortly! After all is said and done …. Why must you trim your beard? Either you are Chassidish or not? If your own Ruchnius isn’t in order, why would I want your music in my children’s ears? Please respond! Modern isn’t success. Thank you Shmuel for your comment and concern. I personally do not think that Beri trims. Many friends of mine who do not trim have beards that look very similar. Not every ones beard grows the same, that is a fact! Responding to Shmuel…Shmiel Ber (Beri) does not and would not trim his beard. And did you notice his long peyos? Come on, don’t judge a book by it’s cover(or a singer by his cd cover lol). Most of this cd was done with help from very chassidishe yungeleit from Monroe, Williamsburg and the like. He’s still young….his beard will grow in before you know it!